The very first question you should ask yourself every time you create a new marketing piece is “What’s the next action?” In other words, what’s the very next step you want your prospect or customer to take? Once you know the answer to that question, you can build it into the email, landing page, social post, blog post, direct mail piece, or any other marketing content you’re creating. It’s also incredibly important that every single marketing piece is focused around ONE specific action — not 2, not 3, just ONE. One great place to investigate this question immediately in your business is your Lead Generation system. 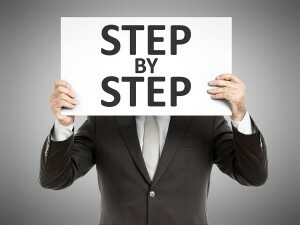 Are you using a very clear step-by-step process when new leads join your list? Take 5 minutes right now and go through your own “new lead” entry process and see for yourself. The red flags you want to look for are points where you’re asking new leads to do more than one thing at a time or places where you’re overwhelming them with complicated text-heavy landing pages and instructions. If you want to increase your conversion rates at any stage of your marketing funnel, you need to keep it clear, keep it simple, and keep it easy. Here’s a great question for you — can you tell me right now EXACTLY what step-by-step process you want your IDEAL customer to go through in your sales funnel? In other words, what exact steps would you want a new lead to go through your system to process from Lead to Prospect to Buyer to Lifetime Customer? What specific actions would you want this IDEAL prospect to go through every step of the way? Sure, not every prospect or customer will go through your step-by-step process exactly as you build it out, but just having a model for how it should work and for how the experience should look will go a very long way towards increasing your conversions and increasing your sales. If you want to build a really good sales & marketing system, you always have to start with a really bad (or really mediocre) sales & marketing system and make it better.